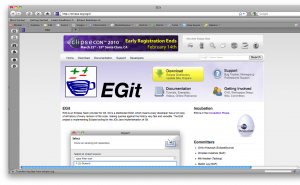 Last night, I updated the EGit and JGit websites in preparation of our upcoming release review. It’s not perfect, but it’s much better than before. If you’re an Eclipse project, I highly recommend you checking out the Nova theme and new default template. Having a good website for your open source project is critical to how people perceive your work. Put yourself into a user’s shoes who is trying to find information about your project. They will use a search engine and the first thing they will come across is your web page.